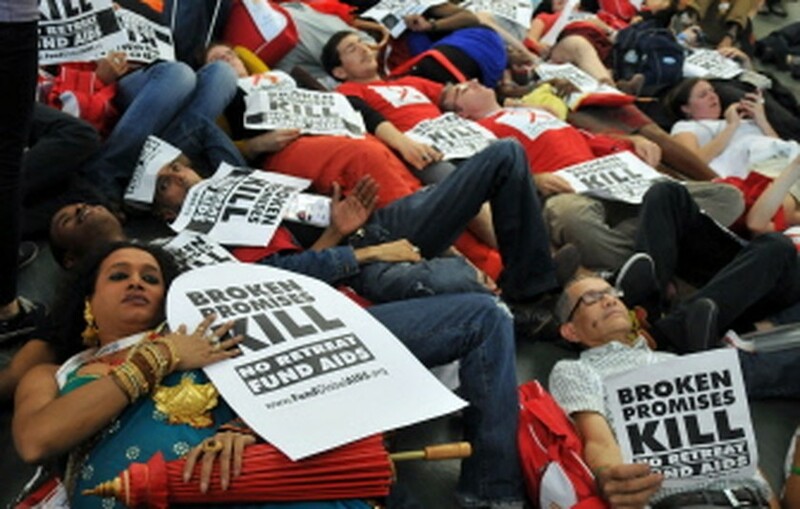 VIENNA, July 18, 2010 (AFP) - A world forum on AIDS opened in Vienna on Sunday to warnings led by UN Secretary General Ban Ki-moon that the 29-year war against the disease was at threat from funding cuts. Launching the six-day 18th International AIDS Conference, the UN chief said in a video message that hard-won advances could all be for naught if countries softened their line. "New infections have declined. Access to treatment has expanded. Decades-old travel restrictions are being lifted," Ban said. "But too many obstacles remain. Some governments are cutting back on their response to AIDS. This should be a cause for great concern to us all. We must ensure that our recent gains are not reversed." The conference, which is held every two years, will update knowledge about antiretroviral therapy -- the drugs that with dazzling success have turned HIV from a death sentence to a chronic yet but manageable disease. Other big news is awaited on the quest for a vaginal gel to thwart HIV and on promoting circumcision to help protect men against the microbe. Both are keys to tackling HIV infections in Africa, home to two-thirds of the world's 33.4 million people living with the human immunodeficiency virus (HIV) that causes AIDS. But optimism that AIDS is being rolled back was soured by a revival of concern about money. Funding by rich economies for poor countries fighting HIV/AIDS fell back last year to 7.6 billion dollars after 7.7 billion dollars in 2008, as a result of the economic recession, the Kaiser Family Foundation and UNAIDS said. The decline ended six successive years of double-digit increases. In 2002, funding for anti-HIV drugs and other initiatives was a mere 1.2 billion. Low- and middle-income economies needed 23.6 billion dollars from all sources for fighting AIDS in 2009, said the report. The gap in funding last year was 7.7 billion dollars. For 2010, 25 billion dollars has to be mustered for fighting AIDS in poorer countries, according to a previous UNAIDS estimate. So far, there is a funding shortfall of 11.3 billion, according to an analysis published this month in the US journal Science. Such problems highlight a cruel dilemma. As there is no cure for HIV, the drugs have to be taken for life to keep the virus under check. The treatment so far is accessible to only five million out of 10 million in need, which means the bill rises inexorably the more lives that are saved. The goal of universal access was enshrined by the Group of Eight (G8) at the Gleneagles summit in 2005, and endorsed in 2006 by the UN General Assembly. Michel Kazatchkine, executive director of the Global Fund to Fight AIDS, Tuberculosis and Malaria, told reporters he was "hugely afraid, very concerned" about the funding gap. The Global Fund, seeking 17 billion dollars in pledges from 2011 to 2013, is to hold a meeting of donors in New York in September. Attaining the sum "should be possible, given that the world mobilised billions of dollars to save the banks," Kazatchkine told reporters. "But I cannot make any prediction about the outcome." Julio Montaner, president of the International AIDS Society (IAS), which organises the AIDS conference, scorned world leaders who had pared the funding for AIDS. "Let me remind you that over the last year, the same leaders had absolutely no problem finding the money on a moment's notice to bail out their corporate friends and the greedy Wall Street bankers, yet when it comes to global health, the purse is always empty," he charged. Other major issues at the meeting include the situation in eastern and central Europe where the pandemic is accelerating, especially among intravenous drug users; and the theme of human rights. VIPs include former US president Bill Clinton and Microsoft philanthropist Bill Gates, both rostered to speak on Monday, as well as rock star Annie Lennox, who will stage a concert on Tuesday. Several hundred activists, demanding funding for AIDS, staged a rowdy but peaceful demonstration just before the forum's official launch. Acquired immune deficiency syndrome (AIDS) has claimed more than 25 million lives since the disease first came to light in 1981, a toll that outstrips the fatalities of World War I. New cases of HIV are rising by around 2.7 million a year, according to UN figures for 2008.